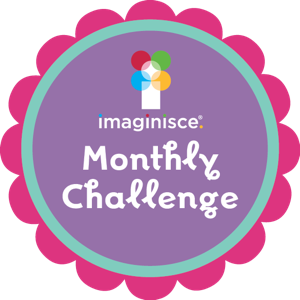 Come and join our Monthly Challenge at Imaginisce. And use at least 75% Imaginisce products to be eligible for the prize. The prize: the lucky winner will receive 2 paper packs of their choice! Won't you join us? Just link up your finished project by the end of the month! You guessed it...everything to do with the Big Screen! that magnifying glass and your thinking cap. I'll also be awarding a prize pack right here from my blog. Be back tomorrow with my first Nook CARDS Challenge for the month...see you then!